Bording, T.S., Nielsen, S.B. & Balling, N., 2016. The transient divided bar method for laboratory measurements of geological materials. Geophysical Journal International, i review. Poulsen, S.E., Balling, N., Bording, T.S., Mathiesen, A. & Nielsen, S.B., 2016. Regional-scale subsurface temperature modelling with inverse calibration methodology: application to Danish sedimentary basins. Geothermics, i review. Kristensen, L., Hjuler, M.L., Frykman, P., Olivarius. M., Weibel, R., Nielsen, L.H. & Mathiesen, A., 2016. Pre-drilling assessments of average porosity and permeability in the geothermal reservoirs of the Danish area. Geothermal Energy Journal. Link. Lindström,S., Erlström, S., Piasecki, S., Kristensen, L., & Springer N. 2016. Middle Triassic to Early Jurassic terrestrial ecosystem change in the Danish Basin. Palaeobotany and Palynology. i review. Vosgerau, H., Mathiesen A., Andersen, M.S., Boldreel, L.O., Hjuler, M.L., Kamla, E., Kristensen, L., Laier, T., Pedersen, C.B., Pjetursson, B. & Nielsen, L.H. 2016. A WebGIS Portal with geological and geophysical data compiled for exploration of deep geothermal energy, Geological Survey of Denmark and Greenland Bulletin. i review. Weibel, R., Olivarius, M., Kjøller, C., Pedersen, P. K., Kristensen, L., Hjuler, M.L., Friis, H., Boyce, A., Andersen, M.S., Kamla, E., Boldreel, L.O., Laier, T., Mathiesen, A. & Nielsen, L.H., 2016. Climatic influence on early and burial diagenesis in Triassic and Jurassic sandstones from the Norwegian-Danish Basin. Geothermics, i review. Weibel, R., Olivarius, M., Kristensen, L., Friis, H., Hjuler, M.L., Kjøller, C., Mathiesen, A. & Nielsen, L.H., 2016. Predicting permeability of low enthalpy geothermal reservoirs: A case study from the Upper Triassic?Lower Jurassic Gassum Formation, Norwegian-Danish Basin. Geothermics, i review. Fuchs, S. & Balling, N., 2016. Improving the temperature predictions of subsurface thermal models by using high-quality input data. Part 1: Uncertainty analysis of the thermal-conductivity parameterization. Geothermics, accepteret. Fuchs, S. & Balling, N., 2016. Improving the temperature predictions of subsurface thermal models by using high-quality input data. Part 2: A case study from the Danish-German border region, Geothermics, accepteret. Olivarius, M., Weibel, R., Friis, H., Boldreel, L.O., Keulen, N. & Thomsen, T.B., 2016. Provenance of the Lower Triassic Bunter Sandstone Formation: implications for distribution and architecture of aeolian vs. fluvial reservoirs in the North German Basin. Basin Research, doi: 10.1111/bre.12140., in press. Olivarius, M. & Nielsen, L.H., 2016. Triassic paleogeography of the greater eastern Norwegian-Danish Basin: constraints from provenance analysis of the Skagerrak Formation. Marine and Petroleum Geology 69, 168-182. Fuchs, S., Balling, N. & Förster, A., 2015. Calculation of thermal conductivity, thermal diffusivity and specific heat capacity of sedimentary rocks using petrophysical well logs. Geophysical Journal International, 203, 1977-2000. Olivarius, M., Friis, H., Kokfelt, T.F. & Wilson, J.R., 2015. Proterozoic basement and Paleozoic sediments in the Ringkøbing-Fyn High characterized by zircon U-Pb ages and heavy minerals from Danish onshore wells. Bulletin of the Geological Society of Denmark 63, 29-44. Olivarius, M., Weibel, R., Hjuler, M.L., Kristensen, L., Mathiesen, A., Nielsen, L.H. & Kjøller, C., 2015. Diagenetic effects on porosity-permeability relationships in red beds of the Lower Triassic Bunter Sandstone Formation in the North German Basin. Sedimentary Geology 321, 139-153. Poulsen, S.E., Balling, N. & Nielsen, S.B., 2015. A parametric study of the thermal recharge of low enthalpy geothermal reservoirs. Geothermics, 53, 464-478. Poulsen, S.E., Nielsen, S.B. & Balling, N., 2012. Estimation of equilibrium formation temperature in the presence of bore fluid invasion. Geophysical Journal International, 190, 1551-1561. Bording, T.S., 2016. Improved Laboratory Methods for the Determination of Thermal Properties of Earth Materials. Department of Geoscience, Aarhus University. Olivarius, M., 2015. Diagenesis and provenance of Mesozoic sandstone reservoirs onshore Denmark. PhD thesis. Geological Survey of Denmark and Greenland report 2015/19, 146 pp. Bording, T.S., Norden, B. & Balling, N., 2016. A comparison study of rock thermal properties measured by transient divided bar and thermal conductivity scanning. Scientifical technical report, Department of Geoscience, Aarhus University, 38 pp. Paci, L. & Fabricius, I.L. 2016. Heat Stotage in Deep Aquifers. DTU BYG – Geotechnics and Geology, 45 pp. Hjuler, M.L., Erlström, M., Lindström, S., Nielsen, L.H., Kristensen, L., Mathiesen, A. & Bidstrup, T. 2014. Extended evaluation of possible geothermal reservoirs in the Helsingør area including geological data from Helsingør and Øresund. Contribution to an evaluation of the geothermal potential. Danmarks og Grønlands Geologiske Undersøgelse Rapport 2014/29. Hjuler, M.L., Kristensen, L., Mathiesen, A., Bidstrup, T. & Nielsen, L.H. 2014. Evaluation of possible geothermal reservoirs in the Brønderslev area. Danmarks and Grønlands Geologiske Undersøgelse Rapport, 34, 81 pp. Balling, N. & Bording, T.S., 2013. Temperatur, temperaturgradienter og varmeledningsevne i den geotermiske boring Sønderborg-1/1A. Forskningsrapport, Institut for Geovidenskab, Aarhus Universitet, 12 pp. Hjuler, M.L., Vosgerau, H., Nielsen, C.M., Frykman, P., Kristensen, L., Mathiesen, A., Bidstrup, T. & Nielsen, L.H. 2013. Assessment of potential capacity increase of the existing geothermal plant at Thisted by adding a new geothermal well. Danmarks og Grønlands Geologiske Undersøgelse Rapport, 80, 90 pp. Nielsen, C.M. 2013. Reservoir modelling for assessment of geothermal energy production from the Bunter Sandstone Formation the Tønder area for Tønder Geothermal Project. 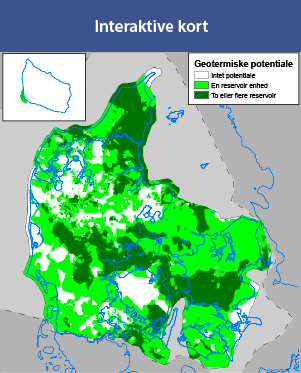 Danmarks og Grønlands Geologiske Undersøgelse. Rapport 2013/17. 43pp. (Appendix B8 in the FDP). Poulsen, S.E., Balling, N. & Nielsen, S.B., 2013. Analysis of bottom hole temperatures on- and nearshore Denmark, Scientific technical report, Department of Geoscience, Aarhus University, Denmark, 23 pp. Norden, B., 2011. Geothermal Energy Utilization in Low-Enthalpy Sedimentary Environments, Scientific Technical Report STR11/06. German Research Centre for Geosciences (GFZ), Helmholtz Centre Potsdam, Germany. Fenhann, J., Mathiesen, A. & Nielsen, L.H. 2010. Geothermal energy. Risø Energy Report 9. Non-fossil energy technologies in 2050 and beyond, p. 51-54. Risø-R-1729 (EN) eds. Larsen, H. & Petersen, L.S. Mathiesen, A., Kristensen, L., Bidstrup, T. & Nielsen L.H. 2010. Evaluation of the Bunter Sandstone Formation in the Tønder area – Contribution to an evaluation of the geothermal potential. Danmarks og Grønlands Geologiske Undersøgelse. Rapport 2010/90. Balling, N., Fuchs, S. & Bording, T.S. Thermal structure of deep boreholes in the Danish Basin. Boldreel, L.O., Andersen, M.S., Kamla, E., Mathiesen, A., Vosgerau, H. & Nielsen, L.H. Seismic interpretation and structural mapping of the Danish onshore area: integration of well and seismic data. Geological Survey of Denmark and Greenland Bulletin. in prep. Bording, T.S., Nielsen, S.B. & Balling, N. Determination of thermal properties of materials by Monte Carlo inversion of pulsed needle probe data. Erlström, M., Boldreel, L.O., Lindström, S., Nielsen, L.H., Kristensen, L., Mathiesen, A. & Kalma, E. Basin assessment regarding Mesozoic geothermal reservoirs in the Øresund Sub-Basin – exemplified by well data and seismic profiles. Geothermics. in prep. Olivarius, M., Weibel, R., Boyce, A.J. & Whitehouse, M. Predicting cement distribution in Triassic-Jurassic sandstone reservoirs onshore Denmark based on estimates of precipitation temperatures. Olivarius, M. & Weibel, R. Alteration of heavy minerals during transport and burial. Olivarius, M., Nielsen, L.H., Weibel, R., Kristensen, L. & Thomsen, T.B. Late Triassic uplift of southern Norway revealed by detrital zircons in the Norwegian-Danish Basin. Balling, N., Fuchs, S., Poulsen, S.E., Bording, T.S., Nielsen, S.B., Mathiesen, A. & Nielsen, L.H., 2016. Development of a numerical 3D geothermal model for Denmark. Olivarius, M., Weibel, R., Whitehouse, M., Kristensen, L., Hjuler. M.L., Mathiesen, A., Boyce, A.J., Nielsen, L.H., 2016. Predicting cement distribution in geothermal sandstone reservoirs based on estimates of precipitation temperatures. EGU General Assembly, April, Vienna, 2016. Kirsch, R., Balling, N., Boldreel, L.O., Fuchs, S., Hese, F., Mathiesen, A., Nielsen, C.M., Nielsen, L.H., Offermann, P., Poulsen, N.E., Rabbel, W. & Thomsen, C., 2016. Predicting cement distribution in geothermal sandstone reservoirs based on estimates of precipitation temperatures. EGU General Assembly, April, Vienna, 2016. Mathiesen, A., Nielsen, L.H. & project partners, 2014. Geothermal Energy Potential in Denmark – status and research challenges. 24-25 November, 2014. Energy and Environment for the Future. Innovation Fund Denmark. Abstract volume. Nielsen, L.H., Mathiesen, A., Kristensen, L., Weibel, R., Olivarius, M., Bidstrup, T., Nielsen C.M., Laier T. & Anthonsen, K.L., 2011. The huge geothermal energy potential in the Danish subsurface – challenges and possibilities. Risø, DTUs Fifth. International Energy Conference, 10-12 May 2011. Proceeding Volume. Olivarius, M. (Interview-person). Historien om Niels Steensen. Ny forskning: Sand er en geologisk tidskapsel [Hjemmeside om Store Danske Videnskabsfolk].